When it comes to laboratory furniture, there are a lot of choices! But where does one possibly begin? From features to customizations, to specific needs and regulatory criteria, there is a lot to consider when starting a new laboratory or renovating an existing space. Furniture will last a long time, so the decision you make today will have consequences for years to come. Here are a few things to consider before making your first purchase of laboratory furniture. Since laboratory set-ups can differ, knowing the type will help determine the furniture needs. Wet Lab or Dry Lab? When considering laboratory furniture, the designers will need to know the laboratory’s intended use specifically, will it be a “wet” lab or a “dry” lab? Wet laboratories are where chemicals, drug, or other materials are handled primarily in liquid solutions. Many times there is a need for chemical-resistant surfaces, built-in sinks, and eye wash stations. And on occasion, showers may be needed, as well. A Dry Lab, on the other hand, is where work is done with small volumes of dry chemicals. These labs tend to possess large amounts of electronic equipment for computing mathematical models or computer-generated tests. Many laboratories require the use of a fume hood for the safety of its workers. When designing a laboratory space and a fume hood is needed, additional considerations should be made. For example, where will the fume hood be positioned in the laboratory? The fume hood will affect air flow and affect energy efficiencies. Placing a fume hood in the center of a laboratory will have a different effect than placing it in the corner of a laboratory. Many times, placement is determined based on safety and duct work needs. Determining the placement of large items such as a fume hood will allow other laboratory furniture to be installed in the most efficient manner. With more demands on laboratories to grow, perform, and produce while working with less resources. There is a great need to find new efficiencies in laboratory processes and design. National Laboratory Sales specializes in the design of custom laboratory configurations. Their experienced lab design specialists will develop innovative solutions. With an expansive inventory they will find a way to make your laboratory efficiently come together in the best way possible. Let them focus on the furniture, while you focus on the performance. Along with gaining efficiencies in laboratory design, price must be considered. Whether you are replacing a few pieces of furniture or starting anew from scratch, price plays a significant role. The return on investment, the life expectancy of products, and cost of ownership shall be assessed before making a purchase. Complete due diligence and make sure that your purchase is a quality investment. Laboratory furniture is a long-term investment that is installed and it not easily replaced. Many companies will accept an order and then build the furniture. This process will last around 2-3 months. Once completed, shipping and install time is likely another 2-4 weeks. Laboratory furniture from National Laboratory Sales is a little different. With a massive warehouse, furniture is already produced and ready to be shipped. From purchase to delivery a custom laboratory cabinet will arrive in a matter of weeks and a newly purchased fume hood can be shipped within a few days. If time is of the essence, know your options as the completion of a laboratory could be delayed if the shipping time is not considered. 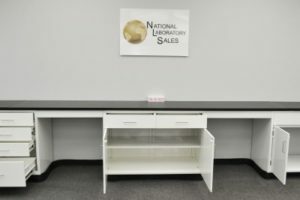 National Laboratory Sales is the place to start for your laboratory furniture and fume hood needs. For assistance in selecting the right furniture and equipment for your laboratory, call and speak to a lab design consultant today at 815-670-6400.